If you want to plan a visit to venezuela, the first thing you need to know is when the public holidays fall. There's no point visiting during the main holidays of Christmas, Easter or Carnival unless you specifically want to see one of the many local festivals that take place during these times or if you're one of those people who feels lonely without a horde of people to keep them company on the beach. Venezuelans love their holidays and will do anything to extend them, so carnival celebrations won't start this year on Monday, 15 February, but on Friday, 12 February, or the Thursday before that and will most likely extend beyond that in most places to Ash Wednesday on the 17th. This is something the Venezuelans call a "puente", literally a bridge, a neat way of stretching holidays out between weekends to maximize the party time available. The same holds true for other moveable feast such as Easter (Semana Santa in Spanish), which officially starts on Good Friday on 2 April and runs through Easter Monday on 5 April. Expect the celebrations to start well before Friday and extend well beyond Monday. 28 March -Palm Sunday - Los Palmeros descend from the Avila mountain with palm fronds for a mass in the local church in the plaza in Chacao, Caracas. 3 June - Corpus Christi - Devil Dancers start the celebrations early on Thursday in San Francisco de Yare, Chuao, Patanemo and 11 other towns. 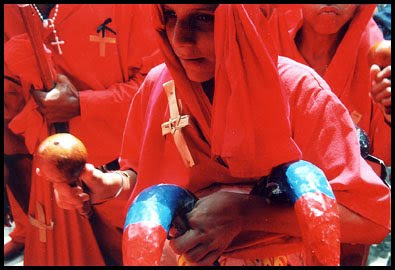 23-24 June - Feast of Saint John the Baptist has a party atmosphere along the coast, where statues of the saint are taken out of the churches to dance to Afro-Venezuelan drumming. 24 June - Battle of Carabobo. The decisive battle in Venezuela's war of independence against Spanish control is celebrated with military parades. 12 October - Indigenous Resistance Day, a public holiday formerly known as Columbus Day. It is also the biggest day for the Cult of Maria Lionza, with thousands of her devotees travelling to the Mountain of Sorte in Yaracuy State to bathe in the river, take part in cleansing rituals and watch the mass fire walking ceremony that closes the day. 24 July - Simon Bolivar's Birthday, Naval Battle of Maracaibo Lake(1823)and Navy Day.It was the last decisive battle in the Venezuelan war of independence. I have to say that I love your page! Is unique!